There was a strange visitor in Shaolin a few days ago. The townies seemed to have some prejudices about her ‘condition’. I don’t know about all that. 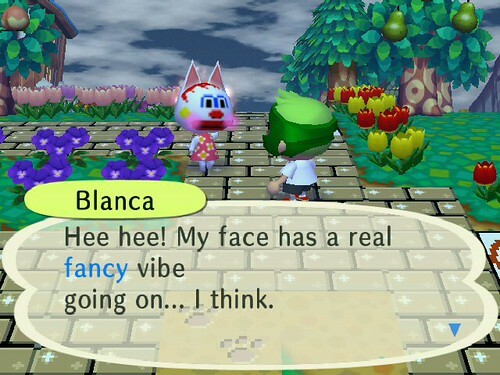 Frankly, I had just assumed that Blanca had an unfortunate medical condition. But now Ruby’s putting doubts in my head… Anyway, Blanca said she had just come from Chibikuro, and she had a face designed by Chokomaru. Cool! I forgot to take a picture of his version. I did manage to snap a photo of the design I created. She told me she wanted fancy, but… oh well! Now, as I’ve written many times, I want Curly OUT of Shaolin. 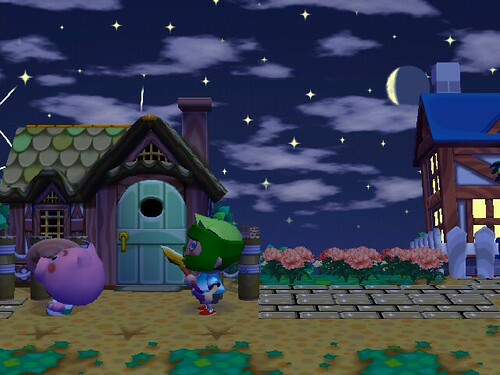 I’m sick of that pink porker and I want a new neighbor. Or better yet, a new townie that DOESN’T live right next door to me, so I can expand my yard space lol! Elise had mentioned leaving (even though she just moved in recently didn’t she???) but I’m pretty sure I talked her out of it. 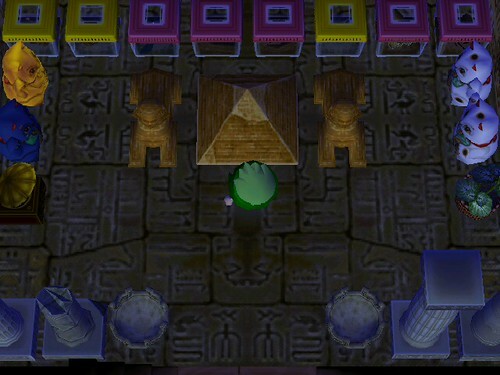 So now I’m campaigning to get Curly out of my town. I’ve been doing everything I can think of to get him to leave. I’ve been pushing him around every time I see him. I even complained about him at the Town Hall. 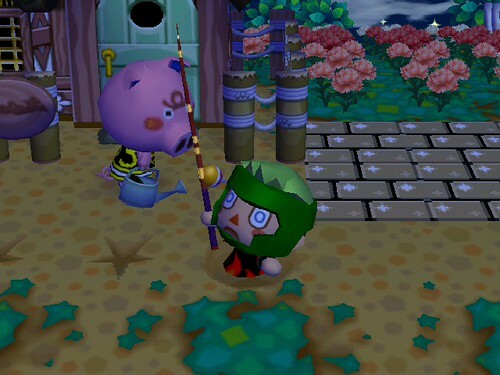 Of course, in my opinion, the best method of getting rid of a certain townie is to ignore them at all costs, and play pranks on them, such as planting pitfall seeds all around the outside of their house! MUAHAHAHAHAHA! Curly wasn’t very amused. He was still pissed off about the abuse I’ve been giving him. Too bad! Move out, Curly! In other news, the Bug-Off is tomorrow! I’m super psyched! I have been stocking up on rare bugs to present so I can have an upper hand in the competition. Plus I have a theory about the colored tops of the bug cages. My guess is that the gold ones are “rare” and the pink tops are “extremely rare.” I’ll see how they get scored tomorrow! I’m excited for the new competition though, it should be more interesting than a boring old fishing tournament! Stocked & Ready to Go! 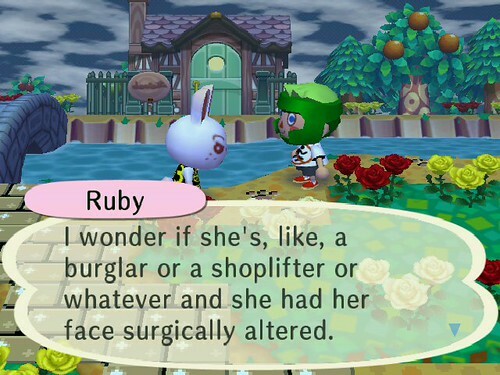 I’ve never have my neighbors talk about Bianca like that. Occasionally they will tell me that some weirdo is wandering around and that they’re scared of her, but never any burglar theories. LOL! Good luck in today’s bug off. I’ve only accumulated a couple of bugs, not nearly your hoard, but I expect to do all right. Can’t wait to see if we get DLC tomorrow. Yay!